It is time for the July Crazy Cooking Challenge. I always say that once July 4th is over that half the summer is gone. I really don’t know where the time goes; it seems only yesterday we were saying we couldn’t wait for some warmer weather. Once again the cooking challenge is sponsored by Tina from Mom’s Crazy Kitchen. We love fried chicken in our house so I was excited to find out that this month’s challenge was fried chicken. I thought that this would be an easy recipe to find, but that was not the case for me. I started off looking on Pinterest, but soon found that there wasn’t anything that interested me when it came to fried chicken recipes. So I started with looking on the web, but still I found nothing that really tickled my fancy. I have a recipe that I found on Barefeet In The Kitchen that was stuck in my head and so I decided to use that one. I actually got my smoothie recipe for last month’s challenge from Mary’s blog Barefeet In The Kitchen also. But like I said I have had the recipe stuck in my head ever since I saw it on her blog and have wanted to try it. So I decided that this challenge was the perfect time to give it a go. This recipe is so unusual and so simple that it can’t help but catch your attention. There are only 3 ingredients for the recipe chicken, salt, and pepper. Now I know what you are thinking, because I thought was thinking the same thing. How can this chicken have any flavor? There are no herbs or seasoning besides the salt and pepper. But this chicken is amazing!! 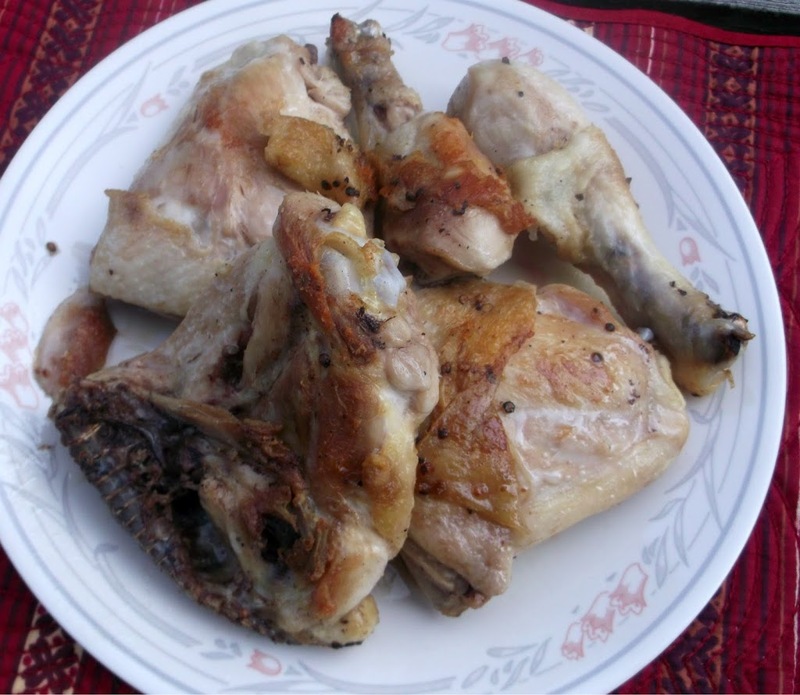 The chicken turns out to be crispy on the outside and juicy and tender in the inside. And to my surprise it was full of flavor. I know that this will be on the menu for a long time coming. The only drawback on this recipe it is messy to make. The chicken is cooks at a medium high heat so it likes to splatter, so make sure you have your apron on. Thanks Tina for sponsoring the Crazy Cooking Challenge again this month. Also thanks Mary at Barefeet In The Kitchen for all the wonderful recipes that you put on your blog. I have made several of your recipes and we always enjoy them thoroughly! Heat a Skillet over medium heat. Generously sprinkle salt and pepper in the hot skillet and then place the chicken with the skin side in the skillet. Then season the top of the chicken with salt and pepper, place the cover on the skillet and let cook without touching the chicken for about 10 minutes. At this point check the chicken, the skin should be nicely browned and crisp if not turn up the heat a little and continue to cook for a couple of more minutes. Turn the chicken over and continue to cook until the juices run clear, about another 5 to 12 minutes. 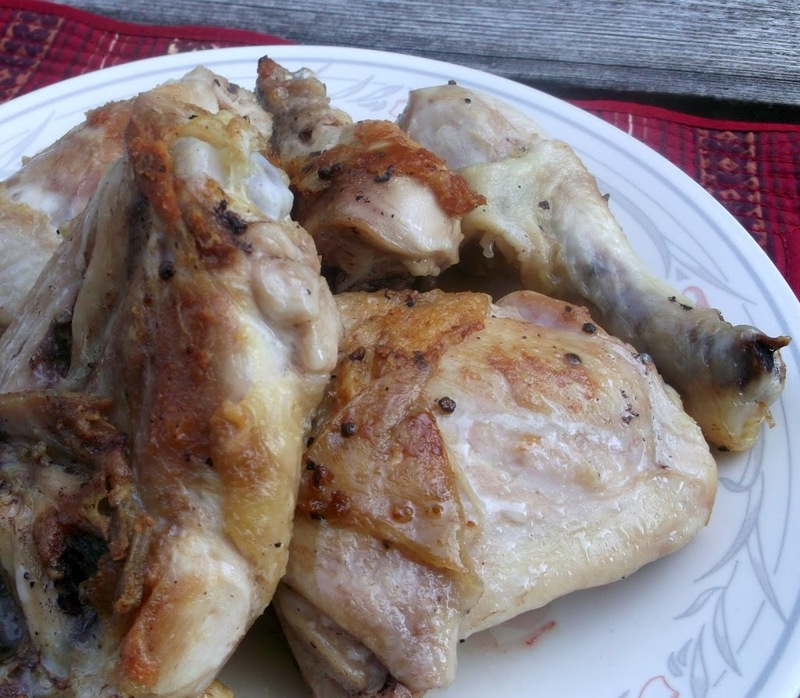 The drumsticks to less time than the thighs and it will depend on the size of the pieces. Remove from skillet and serve immediately. It is so yummy!! (Note: While frying the chicken, it has a tendency to splatter so keep covered as much as possible. Try to hold lid over as much of the skillet while turning over chicken). This truly is simple! 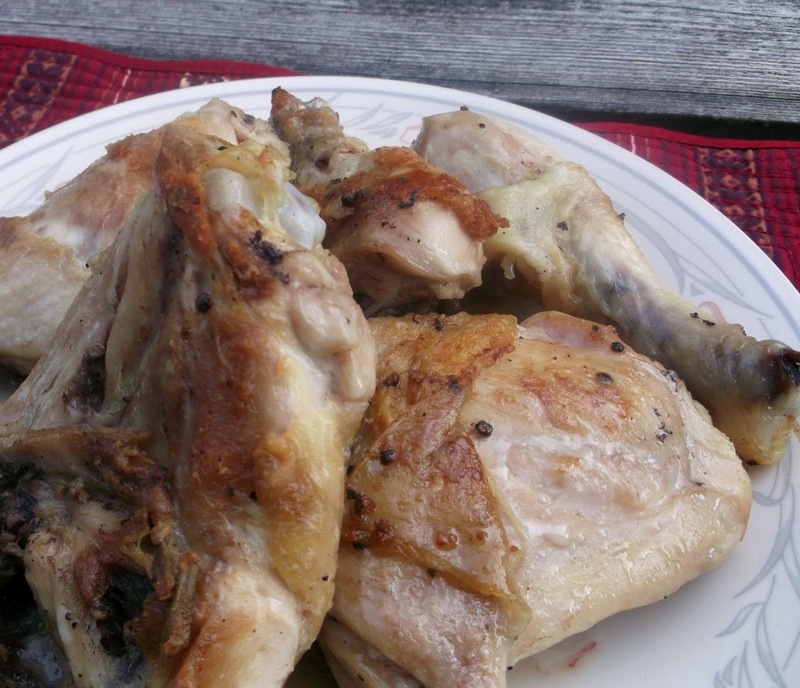 I`m always on the lookout for new chicken recipes, and this one looks like a winner! I am craving fried chicken like crazy now! I like this easy-peasy recipe! It’s been way too long since I last made fried chicken. I’m inspired to make it again soon! You’re right, it’s a simple chicken recipe, but must taste good!